If you're interested in the nature of time (and who isn't) then you may have tried reading books on the philosophy of time, only to find them difficult and obscure - more concerned with showing that other writers on the subject are wrong than with clarifying the issues for the reader. If this is the case then you should give Michael Lockwood's new book 'The Labyrinth of Time' a try, since his approach to the issues involves fit in much better with the idea of a 'popular science' book. The special relativistic argument for the block universe says that someone who is now travelling at high speed past some distant place, say the planet Neptune, might consider the time on Earth to be in the future or in the past of what you consider now. Hence past, present and future are really the same thing. I consider this to be spurious because it tries to fit three tenses - past, present and future - into a structure where there should really be four - absolute past, here & now, spacelike separated events and the absolute future. Once you stop believing in a universal 'now', the argument looks a lot less convincing. The book starts with McTaggart's A and B series argument for the unreality of time - what I consider to be 'traditional' philosophy of time - but soon moves on to the more modern ideas of Einstein's theory of relativity. Lockwood explains this theory as he goes along so you don't need to be an expert to read the book. He looks at what special relativity has to say about the nature of time and argues in favour of a 'block time' view of the universe. I think that this is a spurious argument, but I didn't feel that it detracted from the rest of the book. He goes on to consider the curved space-time of general relativity and looks at its implications for the origin and evolution of the universe, including the inflationary hypothesis, and recent results indicating that the expansion of the universe is accelerating. Having introduced the general theory of relativity Lockwood shows how this might allow the possibility of travelling in time. He looks at Gödel's solution of Einstein's equation which represented a rotating universe and contains Closed Timelike Curves - that is to say that an object can follow a path around such a universe and arrive back before it left . He also considers other ways time travel might be allowed by general relativity, such as wormholes and rotating black holes. He gives plenty of consideration to the 'grandfather paradox', but is not so science-fictiony as some treatments. I felt that Lockwood was fairly dogmatic on the subject of time travel - he seems to say that changing the past isn't just impossible, it's meaningless. I have to say he's not alone in this - many other writers have taken a similar viewpoint. Maybe one day I'll find an author who accepts the possibility of changing the past and looks at what changes to our preconceptions this will necessitate, but it isn't this one. Much of the book is taken up with a discussion of how the arrow of time arises from physics, which seems to be time symmetrical. Hence Lockwood looks at the 2nd law of thermodynamics and examines the problems Boltzmann's H theorem, which appears to derive the arrow of time from the 2nd law. He also considers the other possible explanations of time's arrow - radiative asymmetry, the expansion of the universe and quantum jumps, as well as looking at the spontaneous emergence of order from disorder. Some of the arguments might seem hard to follow, but I think it's worth the effort, as I would say that Lockwood's presentation is clearer than other authors dealing with the same arguments. As I was reading this book I began to notice that one thing was conspicuous by its absence. There was plenty about time travel and about quantum theory which suggested David Deutsch's ideas to me. Deutsch says that travel into the past might be possible, provided you travel into a different universe in the quantum multiverse. Then you could influence what happens in that universe without creating any of the paradoxes which go with normal time travel. Lockwood seemed to be ignoring this, but it turned out that he wasn't. On the contrary, it is the most likely scenario he sees for time travel and he was saving it until last. 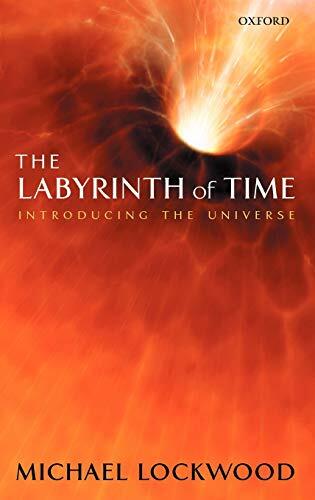 In 'The Labyrinth of Time' Lockwood has produced a reasonably easy to read account of many of the issues involved in the philosophy of time. As well as providing a new look at some of the traditional parts of this subject he also includes an account of much of the current work that is being done in physics and cosmology, including the search for a quantum theory of gravity. The book has plenty of illustrations and devotes plenty of space to explaining the scientific concepts which are needed. Possibly it isn't the best book to start with if you're a beginner to this subject, but if you've read other 'popular science' books on related topics, and so have a little knowledge of relativity and similar, then you shouldn't have too many problems with this one. You might find some of Lockwood's ideas challenging, and I certainly didn't agree with all of them, but I felt that the book was definitely worth reading.